They all think that as long as they ‘believe,’ that it’s okay. But… it’s not. They fall back on ‘grace’ as an excuse for every compromise. This road will lead them all the way to the mark of the beast. 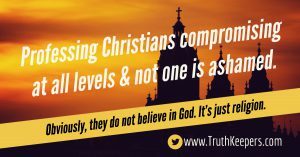 Those who have already fallen away into condoning sin are one problem, but those who know it’s a sin but do it anyway to keep their jobs or whatever… are another problem. Honestly I don’t know what’s worse. Soon that fork in the road will be in front of every professing Christian. If they are not practicing what they preach now, and what they claim to believe, it will be almost impossible to do it then. If we are not living for Christ now, we won’t be worthy to die for Him later.